Wicker furniture has been a design beloved throughout the ages for its durability and natural look. Often used as outdoor patio furniture, wicker items, such as chairs and tables, are sometimes painted to compliment their surroundings, which is done easily no matter the type of material the furniture is made from. Like any surface, however, paint jobs can begin to wear out on wicker over time. Luckily, removing paint from wicker can be done with just a few, low-cost items and a little bit of time. Most people think that wicker is a type of furniture material made from lightweight wood, but they would be incorrect technically. Wicker is actually a technique used to weave material together, which, in the case of most outdoor "wicker" furniture, is comprised of rattan. Wicker is also commonly used to create woven baskets and rugs and can be done with any number of cane-like materials that are easily pliable. Sometimes, wicker furniture is made from synthetic materials, such as vinyl and resin, which are water resistant. Whatever the material, all wicker furniture can be painted, and removal is possible when following a few simple steps. The easiest and most effective way for stripping paint from wicker furniture or other wicker items is to remove the paint from the surface. This can be done in little time with minimal damage to your wicker item by loosening the paint from the surface before you remove it completely. For paint removal, you'll need paint or varnish remover, a paintbrush and a steady stream of water. Because stripping cane can be damaging if you aren't careful, be sure to take your time when removing paint from wicker pieces. To begin, dip a paintbrush in paint stripper for metal or varnish remover and apply it to the surface of your wicker item. Take extra care to push the bristles of the brush into the strands of the material if your wicker item to ensure that all of the paint is reached. Then, use a stiff brush to scrub the treated surface gently until the paint begins to scrub off. Natural bristles are best or you can even trip the top off of the paintbrush you used to apply the varnish remover – just be sure to avoid wire brushes as they can be too harsh on delicate strands. Once the majority of the paint has been loosened or removed, use a somewhat forceful stream of water to wash away the remaining paint. A good option is a regular garden hose, which will be gentle enough to get the job done, unlike a pressure washer, which can destroy the furniture material. If you have several layers of paint that have built up on your piece of furniture over the years, you may need to go back and forth between gentle brushing and washing until everything is removed. This simple technique can also be used as a paint remover for metal surfaces or items. Whether you've just removed a coat of paint from your cane wicker furniture or you have a natural wicker piece you're looking to protect, applying an added layer of varnish is an easy way to increase the lifespan of your investment. 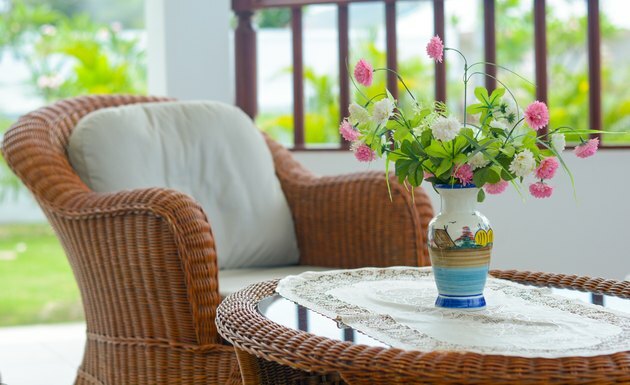 To varnish your wicker furniture, start by cleaning the surface of any dirt or dust to ensure a clean finish. Then, go over the surface with a finely-grained piece of sandpaper to create an even and porous surface for the varnish to stick to. Once your surface is smooth, apply two to three thin layers of varnish and allow it to dry before using it. To keep from having to remove and repaint your wicker furniture later on, reapply with the same type and color of varnish every couple of years for added protection. Can You Waterproof Wicker Furniture?